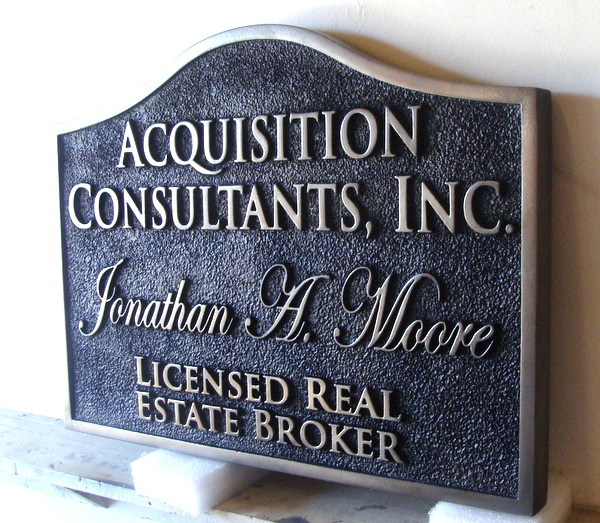 Above is an metallic-silver painted 2.5D flat relief carved sandblasted (sandstone texture) HDU wall plaque, for a Real Estate Broker. The plaque is carved with raised letters and art from High-Density-Urethane, sandblasted and painted, and then the letters are painted with two coats of metallic silver paint. To view other photo Galleries, please click on one of the numbered gray boxes in the lower left margin of this page . To see prices or get Estimate and Order forms , click on gray boxes in upper left margin. Click on dark gray tabs on the header to see Home and other informational pages.